The Sociological Study of Marriage and the FamilySo God created man in his own image, in the image of God he created him; male and female he created them. God blessed them and said to them, "Be fruitful and increase. . . ."Genesis 1:27 - 28With their wedding date still a few months off, George broke his engagement to Carol because he felt she was too "immature" to develop a meaningful relationship. Two weeks later Carol met Carl, who is thirty-two - twelve years her senior - and has been married twice before. His last wife divorced him while he was in a state mental hospital for observation of aggressive tendencies (wife beating). Carol's parents are evangelical Christians and are against her marrying Carl, to whom she became engaged six weeks after they met. Carol has been raised in a Christian home, whereas Carl, although baptized as an infant, has not involved himself with a church since he was a child. Carol's parents want her to go to college and are also concerned that Carl is a high-school dropout. Are Carol's parents' concerns warranted?Fred and Alice have been married for three years and find that they are arguing more and more. Communication seems to have completely broken down. As Alice describes it, they seem to talk at each other rather than to each other. They both feel that they love each other, and they both want their marriage to work. Are there any techniques or procedures that could improve their communication with each other?Ralph and Edith have been married for twenty-three years and have two children, the youngest of whom will be leaving for college in a couple of months. Their other child is married. Ralph suffered a mild heart attack last year, and his doctor has restricted his activities so that he had to turn down a job offer with another firm that would have meant a major advance in his career. Edith had three years of college before they were married, and now that their youngest child is leaving for college, she wants to start attending classes at a local branch of the state university to work toward a teaching degree. Ralph is upset by this because he feels he earns enough money to support the family and because his aged mother, who was just widowed, needs a place to live. Ralph would like to bring her to his home and have Edith stay home and care for her. This has led to serious tension in their relationship. Are the tensions being experienced by Ralph and Edith typical for couples in midlife? Can these types of tensions be avoided or reduced?As we will see, sociology is a research science rather than a helping or service discipline. However, sociological research in the area of marriage and the family investigates issues such as those raised in these three case studies. The research findings can be of great assistance to social workers, therapists, ministers, and others who work with individuals facing marriage and family problems. In this book we will examine sociological research that applies directly to these case studies as well as research related to a variety of other issues.Since each of us is a member of a family, and since over 90 percent of all adults will marry at least once (U.S. Bureau of Census 1990:2), marriage and family is a reality that is part of life for each of us. However, marriage and family are not just personal realities but also social realities, and therefore they are subject matter for study by sociologists. 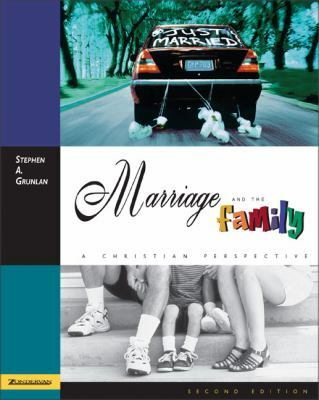 Before looking at the sociological study of marriage and the family, we should have a brief introduction to the discipline of sociology.Grunlan, Stephen A. is the author of 'Marriage and the Family A Christian Perspective', published 1999 under ISBN 9780310201564 and ISBN 031020156X. Loading marketplace prices 5 copies from $27.69 How does the rental process work?